Is hosting your insurance premium finance software a nightmare? Let our insurance premium finance technology specialists oversee all your high tech hassles with our FinanceMaster® Managed Cloud Service and Support. Cloud computing has become extremely popular over the past few years for a long list of reasons but the main reason is . 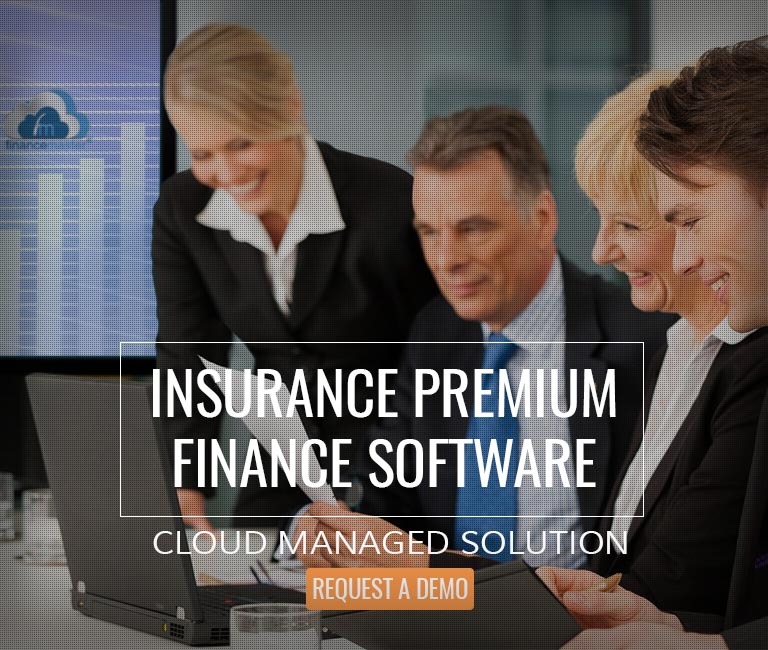 . .
Let our insurance premium finance technology team oversee all your high tech hassles with our FinanceMaster® Managed Cloud Service and Support. You get all the advantages of our FinanceMaster® cutting edge insurance premium management software while greatly minimizing your start up costs. You will not have to pay license fees for Microsoft Server and Microsoft SQL Server. We will perform all FinanceMaster® program updates; We will back-up your database and your data. Your WinFM® application and your WebFM® web site will share the same database. As a result, your insureds and agents will see live real-time data on the web site. You will avoid capital outlays for servers, backup generators and communication redundancy plus the ongoing costs of server upgrades and IT staff. You will be in good company . . .
You can scale up your server capacity or scale down with no service interruption in our cloud environment. Nothing is better than paying for capacity “on demand.” Your FinanceMaster® Cloud Managed system will grow as your company grows. You don’t need to be a network security expert. FinanceMaster® will oversee security, firewalls and handle any cyber threats. We handle your security requirements so you can relax. At your office, at your client’s office, at your home or on vacation, FinanceMaster® cloud managed service follows you everywhere. As long as you have a connection to the internet your business is online and secure. It is a partnership literally made in the clouds. With over 2,300 satisfied users and 32 years of experience in the insurance premium finance software business, Advanced Insurance Systems is here to provide our expert assistance. After working out all the small details, FinanceMaster® Insurance Premium Finance Software has been my friend !!! Balances have stayed true and information being pulled into QuickBooks has also maintained. I have enjoyed the personalized touch our business had received from Advanced Insurance Systems. They have created reports and made changes to their software to help our business run smoothly. I always know I can call their customer support and, if I don’t reach someone right away, they will call or e-mail me back as soon as possible. If I ask a question, I am never told “I don’t know” as a final answer, it’s always “Let me check on that and get back to you.” They have given us many helpful tips from their years of experience in the field of financing that have helped us to become more effective and competitive in the insurance finance market. Thank you so much for your wonderful service. You make using Finance Master a pleasure! 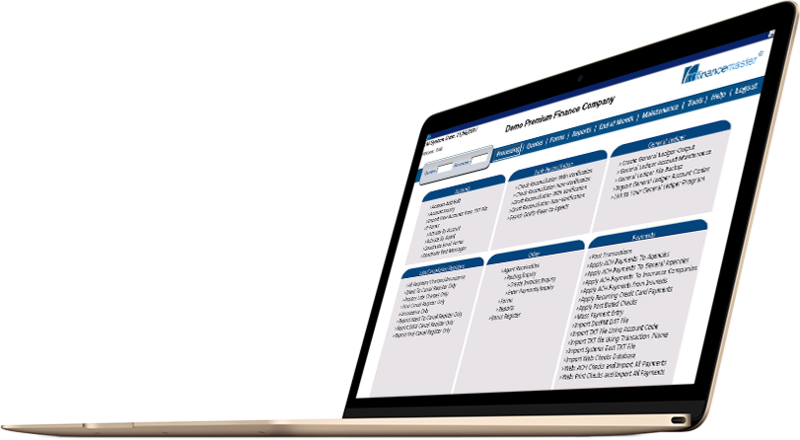 FinanceMaster® Insurance Premium Finance Software is very easy to use and I find it meets our needs at Banker’s Premium. We are a small company but the software offers a lot of options that we can use. I would highly recommend this software to any company just beginning or one that is ready for a change. The staff has been great and prompt in helping us manage our accounts. Thanks for all you do! We appreciate your expertise and valued services to us to run this premium financing company software tools error free and pain less. We also grateful to Art, Kris and the entire team at AIS for their continued service and support. I have been working with FinanceMaster® Insurance Premium Finance Software for 11 years. My experience with the program itself has been Great! Minimal problems which have always been solved within a timely matter. The staff (Kris) has continually through the years been available at a moments notice for help when needed. I recommend their program “highly” to anyone looking. I would like to take this opportunity to give a big thumbs-up to Advanced Insurance Systems and the WinFM software. The software is so user friendly! It is easy to navigate and makes the whole work experience enjoyable. If questions do arise, the tech support is fantastic – no issue is too small or too trivial; you get detailed, understandable answers to your questions and concerns. I have used other premium finance software, but WinFM is the very best. I would recommend it to anyone! 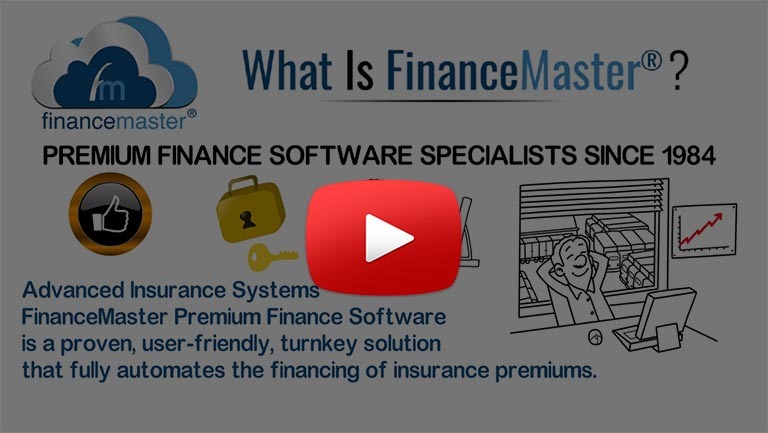 My experience with FinanceMaster® Insurance Premium Finance Software has been a learning experience. I have found the software to be fairly easy to use. The account view and the posting of payments is very user friendly. Cannot think of anything that needs to be changed or made any easier. Thanks. I just wanted to send you a note regarding your FinanceMaster® Insurance Premium Finance Software that we have been using for the past year. Our corporate motto is -We Make it Easy. Your software certainly makes it easy for me to fulfill this promise to our customers. The software is user friendly and your support staff is outstanding. Thanks again for your dedication to your product.